Welcome to the Denali Primrose Bed & Breakfast. Set on 1 1/2 wooded acres in Healy Alaska, this establishment is warm, cozy, and filled with natural light. It is secluded, yet close to the Parks Highway and just minutes away from all the activities Denali National Park has to offer. Enjoy famous Alaskan hospitality from Bed & Breakfast Owner Terry Timeche, and her family, longtime Alaskans and year round residents here in Healy. Their immaculate home is a lovely secluded getaway. If you have a family, there is plenty of room for children to run on the large lawn. 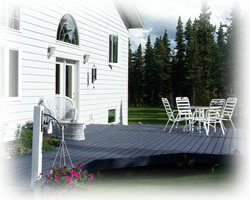 The striking blue deck is lined with colorful flowers that flourish during our Alaska summers. You’ll want to just sit and relax outside, under the Midnight Sun. The Denali Primrose Bed & Breakfast offers two complete suites – one upstairs and one downstairs. The living room, complete with cozy hearth for cool summer nights, and open kitchen, are located on the middle floor. Terry’s colorful handmade quilts cover the walls. Relax and plan your Denali vacation. Terry can help direct you to activities that will fit your schedule. The Denali Primrose Bed & Breakfast likes to bring the outdoors inside, so there is plenty of natural light, thanks to the many windows. Laundry facilities are also available. You’ll feel right at home. No pets, no smoking please. 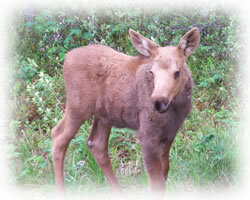 We hope to welcome you on your upcoming Alaska vacation!